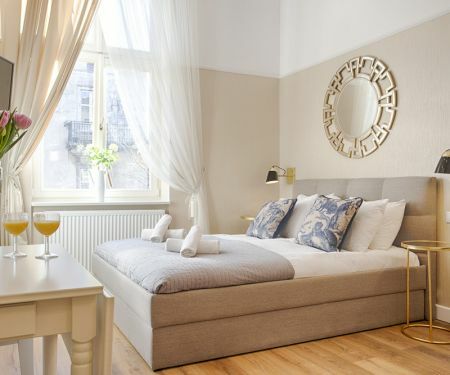 Bright, quiet and spacious, fully equipped apartment for 4 people in the heart of the Old town, at the foot of the Wawel castle. 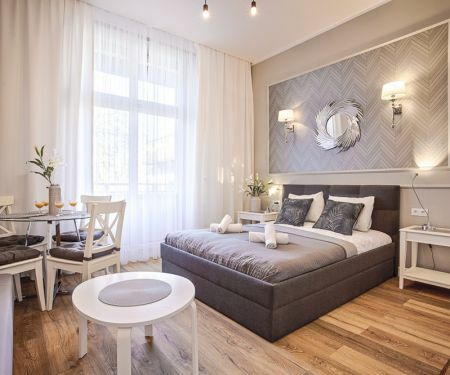 Ideal location between the Market and Kazimierz district. Designed for families, couples, friends and business guests. The apartment space is new, fully furnished and equipped, located on the 1st floor of an antique, renovated townhouse in the heart of the Old town. It consists of a living room, a bedroom, a kitchen and a bathroom. The living room has a comfortable sofa bed, TV and a large table. In the lockable bedroom there are two single beds (90x200), depending on the needs can be combined into one large bed (180x200). The kitchen includes a fridge, electric hob, kettle and all the necessary utensils for cooking and dining, as well as an iron and ironing board. Private bathroom features a shower, also comes with towels, a hairdryer and toiletries as well as bathroom amenities. A baby crib is available in the apartment. Free Wi-Fi internet access is available in the apartment. Mam na imię Magdalena, z zawodu jestem architektem. Moją pasją są podróże oraz sztuka.